Lipid and Liquid-based formulations (LBF) based on oils, surfactants and cosolvents represent a robust approach for improving bioavailability in either liquid-filled hard capsules or soft-gelatin capsules. Liquid and semi-solid fill technologies are well suited to compounds with low aqueous solubility or poor permeability and have long-established market precedence. Lipidic vehicles are generally well absorbed from the gastrointestinal tract, providing better oral bioavailability than can be achieved with the solid drug substance. We have expertise using oil-based and oil-free formulation approaches, as well as self-emulsifying vehicles, as shown in the table below. 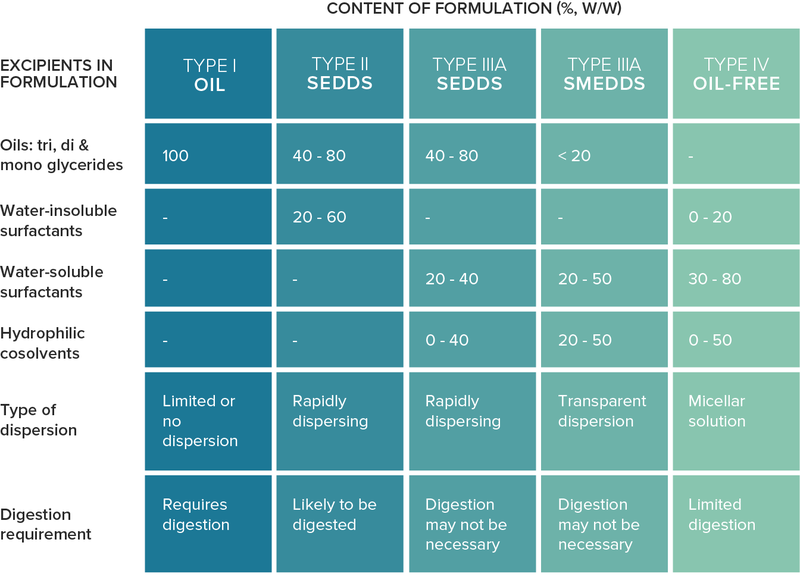 Formulation types are based on the Lipid Formulation Classification System (LFCS). Capsugel scientists have developed many self-emulsifying drug-delivery systems (SEDDS) and self-micro emulsifying drug-delivery systems (SMEDDS) for the oral administration of drugs with poor aqueous solubility. These systems form emulsions or micro emulsions upon contact with aqueous media. During preformulation studies, we employ our extensive knowledge of the range of excipients used in self-emulsifying systems that meet global Regulatory requirements. Our Lipid Expert System™ supports and accelerates lipid-based formulation development by allowing rapid selection of the optimal lipid approach. This system is based on an extensive database of phase diagrams experimentally generated by a team of experienced formulation scientists over more than 10 years. These phase diagrams cover some of the most widely used, commercially available excipients, ranging from oils to hydrophilic solvents, as well as surfactants with various hydrophilic/lipophilic balances and assorted chemical families, among other inclusion criteria. Binary, ternary and even quaternary systems have been dispersed in aqueous media, and relevant phases recorded. The resultant data have been collated, centralized, and made available through a decision tree. Capsugel has a full range of production capabilities for liquid-filled hard capsule and soft gelatin capsules, appropriate for laboratory scale to commercial scale. Specialized filling and sealing equipment is in place for feasibility, ICH stability and clinical batch manufacture. Our commercial-scale production facilities are accredited by the U.S. Food and Drug Administration (FDA) and Medicines and Healthcare Products Regulatory Agency (MHRA). Specialized lipid multiparticulate (LMP) technology has also been developed to provide the functional benefits of lipid-based systems in a flexible multiparticulate format while providing additional controlled release functionality to a formulation. Capsugel also has extensive experience using lipid-based formulation and liquid / semi-solid fill technologies to solve other formulation challenges, including issues with low-dose / high-potency drug candidates, content uniformity, API stabilization and food effect. Have a Lipid and Liquid-Based Formulation challenge?